On view until May 23, 6pm. 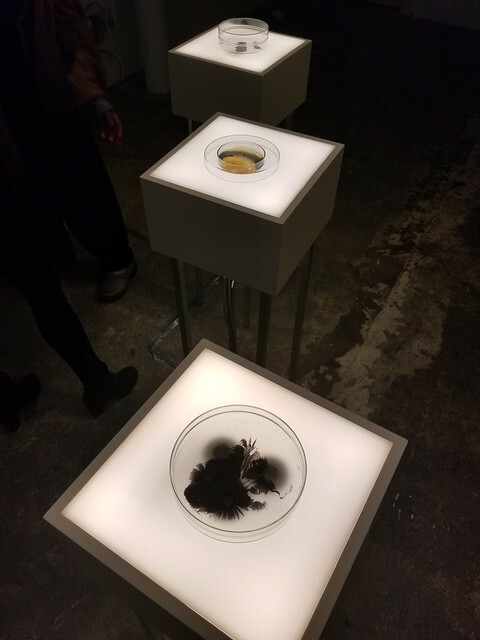 The exhibition Four Pieces and a Half presents work by current resident Jenny Brockmann which deals with the handling and the effects of uncertain knowledge in interaction with humans. Whether it is the weather forecast, the forecast of a volcanic eruption, the probabilities of the next earthquake, the next stock market move, or the next election result – with the need to maximize our safety, information about these events are transformed into future facts and thus produce the so-called uncertain knowledge. Using the media kinetics and sculpture, Brockmann works across a variety of genres and questions the connection of scientific data collection and its shifting transfer by attempting to apply it to everyday life. Massive and fluid magnetic connections, kinetik constructions and shadow plays have an aesthetic appeal that follows Brockmann’s artistic intent. Poetically and precisely, this exhibition, through the presentation of works from 2017 as well as showing findings of her actual research during the residency provides an insight into Brockmann’s working practice. Jenny Brockmann (born 1976, Berlin) has exhibited internationally in solo and group exhibitions including Manege, St. Petersburg; Museo de Arte de El salvador, San Salvador; Nordart, Rendsburg; Kasko, Basel; St. Pancras, London; Gallery Gerken, Berlin; Museo para la Identidad Nacional, Tegucigalpa; Haus am Lützowplatz, Berlin; German Consulate General, New York; The Genia Schreiber University Gallery, Tel Aviv; Hudson River Center for Contemporary Art, Peekskill; Kaohsiunh Museum of Fine Arts, Taiwan; Viborg Kunsthal, Denmark and Vögele Kultur Zentrum, Switzerland. See more information here. This exhibition is made possible with support from WNS Foundation Germany and Consulate General of the Federal Republic of Germany in New York.